The cannon is the first building that a player of clash of clans build at the starting tutorial. They are cheap and effective at low levels and in the beginning of the game. They attack only ground units. The cannon is great as point defense against single units. They are strong against weak units like wall breakers, most of the time they are killed with 1 shot. 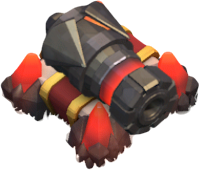 It is wise to upgrade the cannon and mortars at low levels, they are cheap and are fundamental for your defense. Placing cannons close to air defenses can have it’s advantage. Air defense can only attack air targets, the cannon can protect the air defense. Cannons do fire fast and can fire at middle range targets. When strategically placed they are great against wallbreakers. If you place the cannon in the outside of your defense, giants will attack those first. Your mortars and wizard towers can attack the giant freely. The cannon can’t attack air units. Canons that are not guarded by defenses that attack air units it is easy to take it out with a balloon, or minion. Cannons only attack single targets, you can take cannon out easy with a few barbarians or archers.